This morning at 8:47am Tim Peake took part in his first ARISS school contact with the Sandringham School in St Albans as part of the Principia mission. Tim seemed to handle his first ISS Contact well although there appeared to be some problems with the school hearing the ISS and quite a few reports of amateurs calling the ISS on the downlink frequency of 145.800. 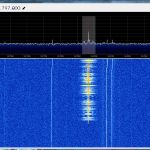 That said I managed to hear the pass well and took an recording using SDR#, Airspy SDR & my usual tracked Wimo X-Quads.